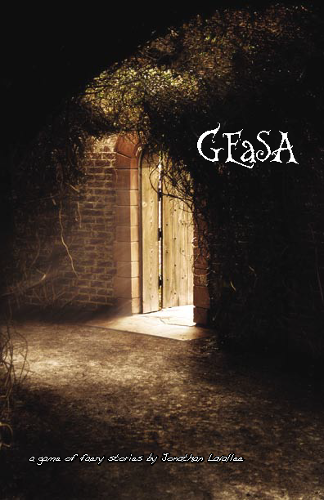 Geasa is a collaborative pen&paper roleplaying game where people try to achieve their dreams and play faeries that get in the way. Geasa is a game where you build your world as you build your characters. Geasa is a game of unlimited possibilities deﬁned only by your imagination. With a simple bidding mechanic that helps direct when you want to focus on your character and when you want to be an antagonist for someone else.